Dr. Chronister practices general Orthopedics which includes treatment of all types of sports related injuries, arthritic conditions, and complex traumatic injuries of the extremities. Additionally, he specializes in less invasive and arthroscopic surgical techniques for conditions of the shoulder, elbow, knee, and hip. Dr. Chronister has a keen interest in the management of cartilage and soft tissue injuries of athletes, as well as partial and total joint replacement of the knee and shoulder. 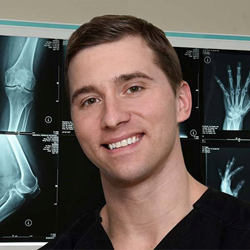 Dr. Chronister offers customized Orthopedic care with a focus on educating his patients on management options and close attention through the recovery process. His goal is to preserve or repair his patients’ tissue whenever possible and to return his patient to their pre-injury level of activity. Previous patient, Andrew Somer said in his enthusiastic recommendation, “Dr. Chronister has been so accommodating, going above and beyond to make sure I was the most comfortable that I could be on the day of surgery. He has a great sense of humor and that helped ease my anxiety over the procedure. He’s been through every step of the pre-op and surgery, and even there for all my follow up appointments. This personal attention has meant the world to me. He has learned a great deal of professionalism and ethics that I can only site back and be awed and impressed by. He’s a very talented young doctor, and he has a great career ahead of him. Dr. Chronister is affiliated with Nobilis Health. He utilizes Southwest Freeway Surgery Center and Hermann Drive Surgical Hospital when a surgical procedure is required. Southwest Freeway Surgery Center is an outpatient ambulatory surgery center, offering patients a quality of care comparable to a concierge and a convenient alternative to a hospital based care. Dr. Chronister expresses, "I take my patients care very seriously and that includes the surgery facilities that I utilize. I believe that their environment needs to be comfortable and the staff needs to be compassionate in order to make their surgery experience the best that it can be." Southwest Freeway Surgery Center is known for providing exceptional, personalized, attention in their state-of -the-art facility that enables patients to return to their own home to begin healing on the same day. Hermann Drive Surgical Hospital is located in the world-renowned Texas Medical Center, Houston. The healthcare staff members at Hermann Drive Surgical Hospital are dedicated to healing and wellness through innovation, education and the most elevated patient experience available. For more information about Dr. Chronister visit http://www.drjustinchronister.com. For more information about Southwest Freeway Surgical Center visit Nobilishealth.com. Hermann Drive Surgical Hospital information can be found at hermanndrivesurgicalhospital.com.